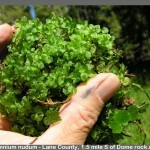 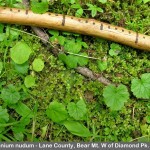 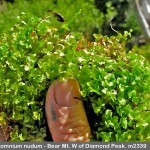 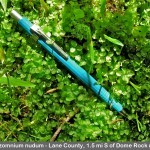 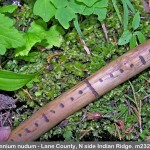 A rare moss in our area is Rhizomnium nudum. 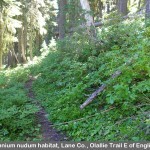 I searched for it on the Willamette National Forest in 2007 and found it was pretty specific in requirements. 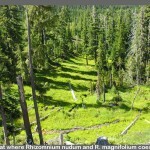 Although it showed up very occasionally in aparently random spots on shady, north facing, subalpine slopes, it could be reliably found in certain habitats. 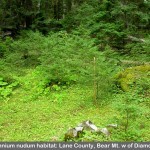 It likes to be at the bottom of a steep, open slope in a basin facing NE, where snow accumulates enough in the winter to prevent trees from growing. 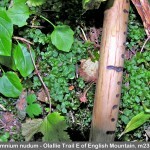 It grows in this moist spot above where permanent water flow occurs.